An ex-footballer who described gay people as “detestable”, and who was appointed as an equality advisor to the Football Association (FA), has stepped down. Michael Johnson was appointed to the FA’s Inclusion Advisory Board which will meet for the first time this month and was created to “promote inclusion and tackle discrimination in all its forms”. 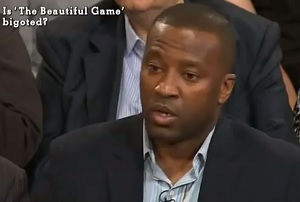 The former Birmingham City defender was asked by the BBC’s Nick Campbell if he would support the FA’s fight against homophobia during a discussion programme in 2012. Following the revelation, the 40-year-old apologised, but today he stepped down. In a statement posted by the FA today, Johnson said: “I’ve taken time over the weekend to reflect on the media coverage from last week and feel that it’s in the best interests of all concerned if I step down from my duties with the Inclusion Advisory Board. Former NBA player John Amaechi and human rights campaigner Peter Tatchell both criticised the decision of the FA to bring Johnson on board. The newly elected Chair of LGBT+ Liberal Democrats, Ed Fordham, wrote for PinkNews.co.uk on how the appointment of Johnson shows the path to full LGBT equality has a long way to travel.